The Weekend Baby | Kimchi with Eish! It’s Monday, once again and the weekend is but a memory. But my first real weekend in Daegu was actually kinda awesome. So on Friday we had plans to head downtown, but this had to wait as my school arranged for my furniture to be delivered later Friday night. Since I was anxious to sort my flat out the furniture was a must! So we had to wait until 7.00pm for the furniture guys to arrive, and then they had to assemble my desk and closet. So we only left for down town at 8. Oh well, this is Korea and time is irrelevant. The reason for heading downtown was to party up with the Epik Daegu peeps. Amanda and Anika celebrated their birthdays and held one big get together at Billi-bow! (more on that later). So Nicola, Diane and I took bus no.3 to Sangin station from where we could go by subway to downtown. When we got off the bus and walked towards Sangin station one of Nicola’s heels broke! Major dilemma! So Nicola walking like a gimp headed towards homeplus to look for new shoes. The time is already 8.30pm and we were supposed to meet all the Epik peeps at 7pm at the downtown subway station. So on our way to Homeplus we pass a small shop with shoes in the window. It seemed like a shoemakers shop. Guess what – it is! So the guy fixes Nicola’s boot in no time and it only set her back 1000 Won. So we finally got on the subway. When we arrived at the downtown station we had no idea where the Epik people went, so we had to find a PC Bang and check. So on facebook it said that they would all go to Bill-bow and we sort of thought we knew where it was. We didn’t! We walked for about 2 hours trying to find the place in the rain. We delayed our great search for this mystical Bili-bow to grab a bite. We then continued on and to our surprise we actually found the freakin place. When we arrived most of the people were pretty much sloshed seeing that we got there at 11pm. That didn’t matter because we had a great time with all the Epik folks and all in all a great night. Now Bili-bow: It is the weirdest awesomest game ever. It combines pool and bowling. 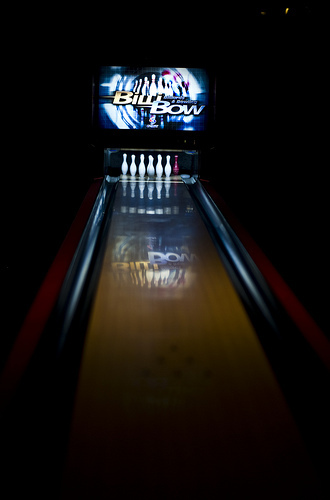 So you have your ten pins at the end of the table and a pool stick and ball to hit the ten pins. It was great fun! I came second only by two points!!! The rest of the night we had a few beers and played darts. We left at 4 am and only got back to our apt’s at around 5. Saturday we slept in. We slept until 3pm. It was great! Just to be able to sleep and not care. Not having to go to work, bliss! So when we finally emerged from utter laziness, we decided to head for Seonum Market. Apparently it is the third biggest market in Korea. I don’t know, but when you say market I usually expect cheap stuff. That’s why went. We needed to buy a few things for our apt’s but the market was definitely not the place. The prices on most of the goods there were the same, and some even more expensive than in the department stores. So we left the Market kinda disappointed. We headed home and enjoyed a beer at my local hof (pub). So on Sunday we finally took over Nicola’s stuff! She only lives 1 block from me. It is really close by. Her apt is much nicer than mine, but then again it doesn’t take much. It is a little bigger but in a nicer area as well. But we live so close to watch other that it doesn’t really matter! Later we went top E-mart to do grocery shopping, but oh what a mistake. It seems that the whole of Daegu went to E-mart yesterday! So we got a trolley and tried to get some food and basic goods. But this is no easy task. Now you have to realize that everything is in Korean and if you are lucky they have pictures on the packaging. Then there is the abundance of people coming from every direction and not giving a damn about me and my personal space bubble. I couldn’t do it! I left my trolley right there in the aisle and walked out. Although I lost 100 deposit in the trolley I couldn’t cope with it! I know that is pathetic, but Korean grocery shopping is a really daunting task. So I still don’t have any food in my apt, but luckily there’s a restaurant around every corner. Grocery shopping can wait! It’s a new week full of new challenges and my fist full schedule at school. Cheers, from my dodgy Korean alley!